I know this is a very strange post, but the teacher inside me is just thinking about all my educator friends who are bracing themselves in preparation for spending an entire school day with a classroom full of eager little candy seekers. Yup, Halloween in elementary schools, yikes! I knew a lady who just went ahead and got a sub one year-- all the other teachers were soooo jealous! Anyway, I happened to have a few ideas to help a teacher embrace the madness and still make it a productive day, so I thought I'd share. #1 Graph It! Hello candy math! And, if you do end up having the kids bring 2 or 3 of their favorites then you'll also be polling the class when you do this one. #2- Alphabetize It! This might be best done in small groups. Mix the candy up a little so groups get everything from Airheads to Whatchamacallits! You could also have the kids write a mad libs style story using their candies-- kind of like a candy bar card. #4- Sort It! There are dozens of ways to do this: by manufacturer, contains nuts, chocolate vs. non chocolate, soft candy vs. hard candy, color of wrapper, etc. Let the kids pick! Do it a couple of ways-- you've got all day. This is just the beginning! You could weigh it, you could look up the nutrition information and compare that, you could make patterns. You could line them up end to end and measure them. 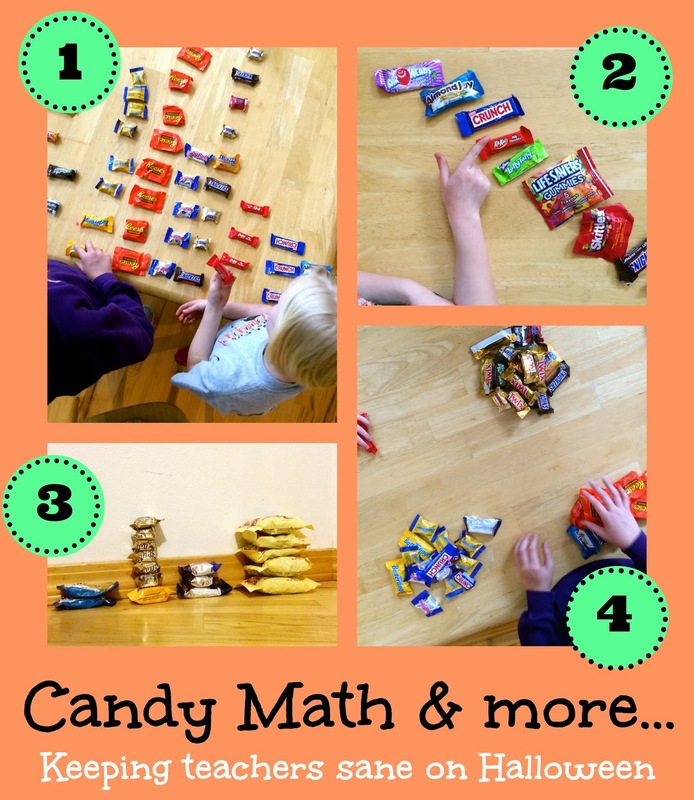 You could use the candy as a unit of measurement and see how many pieces of candy it takes to go around your whole classroom. How many candy bars high is a desk? They could write a persuasive essay on why their favorite candy is superior, they could create an ad, or write their own story problems about the candies. You could have the kids come up with their own candy-- what would it be named? What would be in it….I'm telling you-- there tons you can do and plenty of ideas for all different grade levels. Anyway, if you happen to be one of those saintly people who are gonna be with my kids all day on Halloween I must say THANK YOU and maybe it won't be so bad if you just go ahead and give into the insanity, in an educational way of course!